M.A. 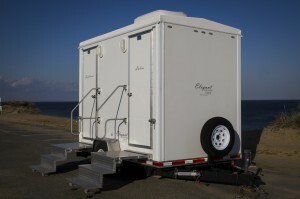 Frazier Enterprises, Inc., is Cape Cod’s leading supplier of portable restroom facilities. We are proud to provide a line of elegant restroom options for your wedding reception or other special event. Our VIP Restroom Suites offer an aesthetically pleasing interior complete with hardwood floors, porcelain sinks and toilets, heat/air conditioning, hot and cold running water, stereo music and a toiletry basket. If your venue can’t accommodate a trailer, we have individual flushing units that are detailed after each event. 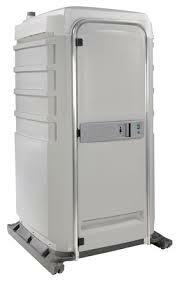 These units have a flush pedal which ensures that there will be no visible waste. See below for additional details. 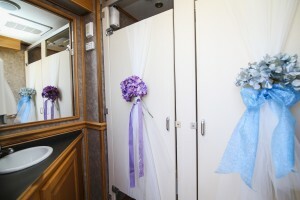 Our VIP Suite Restroom Trailers offer the ultimate in elegance. We offer two sizes in this line, the VIP Senior and the VIP Junior. They are designed with porcelain sinks in oak cabinetry with matching trim, surrounded by simulated hardwood floors and simulated marble walls. Porcelain toilets are in fully enclosed stalls as well as partitioned urinals. If you are planning a special event that requires the utmost in luxury for your guests, then we highly recommend our VIP Suite Restroom Trailers. 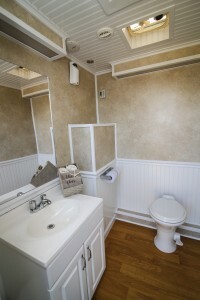 VIP Suite Restroom Series Trailer (Exterior). Click here for a diagram. One 3/4″ garden hose water source. This unit features a freshwater flushing toilet, cold water hand sink and a soap and paper towel dispenser. These units also come equipped with a courtesy mirror, coat hook, vanity shelving and a solar-powered interior light. We offer these bathrooms in standard blue or white. The white units are more sought after for weddings and special events, and they sell out quickly so book soon! The Deluxe Restroom has been designed exclusively for outdoor events. Its innovative European styling provides a smooth surface and roomy interior. It conveniently includes hand sanitizer. Please visit our parent site, M.A. Frazier, Inc. for more information on our construction units and contractor specials!